What are the types of microlearning that cater tailored needs of new-age learners? You have been watching videos, playing games in a virtual environment, and listening to podcasts. All of these can be employed to create eﬀective microlearning content. Delivery of chunked content bolsters the online learning approach. In addition, microlearning helps to improve retention rate, bypassing the forgetting curve of learners. There are different types of microlearning that can be easily integrated in eLearning solutions to cater tailored needs of new-age learners. Videos can be watched outside of the learning environment as per the learners’ convenience. Visual cues are appealing to learners’ sensory-based learning preferences, increasing retention rates. Videos can depict any number of to-do-lists, tasks and assessments. Blogs open the discussions digitally on a global scale. Trainers create blogs to keep learners, informed about assignments, new courses, etc. Blogs summarize the content, focusing on important topics covered and practices to be followed. Podcasts feature industry experts, organizational leaders, and other specialists. These serve as tools that learners can review as per their convenience. These are portable as content is assessible on iPods, iPhones, and other mobile devices. Job aids help learners perform their tasks in an efficient way. They come in different formats such as diagrams, checklists, ﬂowcharts, and decision tables. No matter what the format is, a job aid helps learners to complete a speciﬁc set of actions. Discussed below are various ways job aids help to boost microlearning process. These can be matched to segments of a lengthier learning course. Learners use job aids to give context for a video they watch. These are useful, especially when a quick update occurs. These aid learners at different stages, from doing something for the ﬁrst me to remembering and implementing the process at workplace. Social websites engage huge audience with short and relevant discussions. Social media presents an opportunity for learners to interact in real-me scenario with industry experts and leaders. Trainers can share the training material on platforms like Instagram or Pinterest and even host an entire course on a speciﬁc platform. Daily tips help learners keep engaged during the whole training session. Interactive videos to grab maximum attention of learners with the on-screen elements. Branching scenarios require learners to choose an action that helps to make decisions. Hands-on elements help learners to do things and develop beer understanding of content. For instance: Click, drag, drop, and hover tasks to reveal information and ﬁllable components such as feedback forms, assessments, and others. 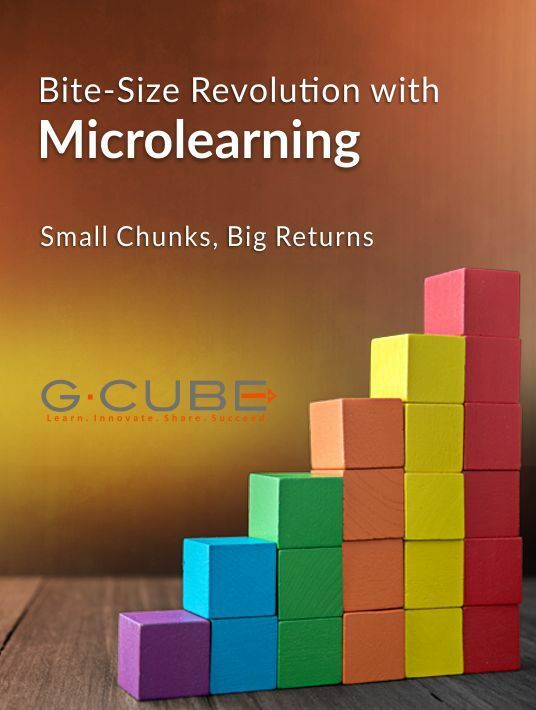 If you want to know more about how microlearning can benefit your organization, download the free eBook Bite-Size Revolution With Microlearning Small Chunks, Big Returns.